Be a Unicorn frosty ice slush maker & decor ice food cup. Enjoy beach Party! Surprise! Here is a good news for the people that great unicorn slush maker cart is being opened at the frosty ice food beach for some source of enjoyment. So, what you guys are waiting for??? 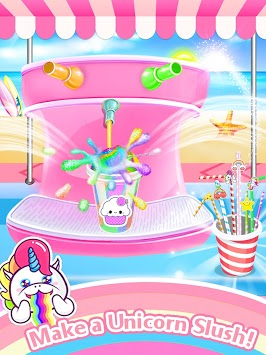 Install the Unicorn slush making cart game now and start getting the taste of flavored unicorn frosty slush. From blueberry to grapes, there are tons of flavors but taste isn't the only thing you can customize. 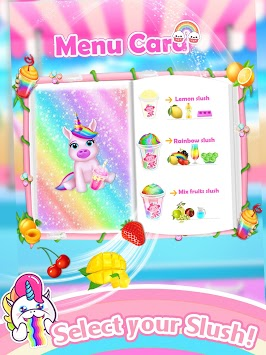 The frosty ice slush contain rainbow unicorn ice flavors with colorful ingredients. Decorate your frosty slush ice cup and make Unicorn Rainbow Slush cup looks cool. Perform as a Frosty ice slushy master, and you’ll stay cool all summer long! Enjoy the rainbow ice dessert at the beach party along the slush maker cart.So are you ready to explore the fun of the beach as you can make various types of ice frosty slush by adding rainbow flavored sauces in it.Dress up your cup with glittery eye catching flavors.By installing the unicorn ice slush maker you can enhance the intelligence level of your child. 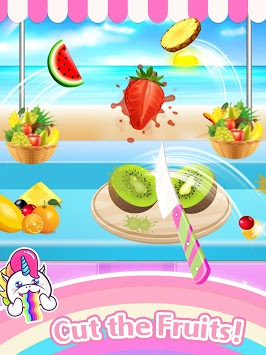 Download the unicorn frosty slush maker game and enjoy the fun then! Unicorn frosty slush game full of rainbow eye catching ingredients. Add ice slushy flavors for the perfect slushy treat. Perfect slush maker app for all users.